Call them group agreements, ground rules, or rights and responsibilities — this is what we ask the whole group to agree to for the duration of the class. -If you need a drink of water or a visit to the bathroom, go right ahead. If you need to leave and not return to the class for any reason, please pull an instructor aside and let them know, so that they can hear if you’re doing alright or getting the support that you need. -If you’d prefer to sit out a particular activity and just watch, that’s fine (we say that “observation is full participation”). -If you have an injury and you’re about to practice physical skills, be mindful of it, and let your partner know (at the same time, we remind folks to support those they partner with by helping remember to initiate the check-in before starting a physical exercise). -If you have a strong emotional reaction to something in the class, seek support. If someone shares a personal story that offers you tools, great. But be conscious, in sharing with others outside this space, not to divulge people’s personal info. In other words, the plot can leave, but the characters’ identifying details stay here. If you’re a talkative person who is comfortable sharing in groups, try to step up your listening skills and leave more space for other people to speak. If you tend to be quiet in groups, try to step up your active participation skills and speak up. Oppression — like racism, sexism, classism, homophobia, ableism, transphobia, adultism — exists in our society. It also exists in this room. Since we are working toward building a liberated space free from these systems of oppression, we need to be free to name and move on from them when we notice them playing out. Therefore, we encourage everyone to be conscious of oppression, and be willing to accept feedback and respect others when they name oppressive behaviors. Answer any questions folks may have. Make sure to get everyone’s agreement. 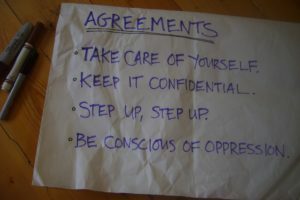 If necessary, you can remind the group of these agreements during the class.